She is an economics graduate from St. Xavier’s college, Mumbai University and holds an MBA degree in finance. She has lived in major cities across the world – Delhi, Singapore, Zurich, Dubai, and New York City (currently based in Mumbai). She has worked with major news channels such as Times Now, NDTV Profit and Bloomberg-UTV. Her debut novel ‘One & A Half Wife’ won her the national literary Muse India’s Young Writer Award and many others. Her stories have been published in a dozen global literary magazines including Avatar Review, Wasafari, Eclectica and QLRS. Her second book, Happy Birthday! , is already earning rave reviews. She is none other than, the very reputed and famous author ‘Meghna Pant’. In an exclusive interview with ‘IndiaBookStore’ the author shared insights of her new book, the secret behind her success and a lot more. QUESTION 1- Tell us something about your latest book, ‘Happy Birthday! and other short stories’. Happy Birthday! is a collection of thought-provoking short stories that are written with delicate and rare human sensibility. They are steeped in reality, that empty space where the individual and society intersect, the place where what is said and left unsaid meet each other. It captures the life of many individuals, mostly from middle-class families in India and America, ranging from a blind stalker, a retired civil servant, a prostitute seducing a Gujurati businessman, a slum girl who wants to play national basketball, and an American tourist in an ashram. The stories have been called ‘provocative and inspirational’ by Ashwin Sanghi, ‘deft and merciless’ by Jeet Thayil, and ‘surprising and moving’ by Chitra Banerjee. The reviews from both critics and readers have been overwhelmingly positive and I am so happy that people are loving the collection. QUESTION 2- There were so many stories in the book, why did you decide on ‘Happy Birthday’ to be the title? The joy of the title has been selected to juxtapose with the mnemonics within the balloons on the cover. The whole point is to capture duality; the beauty and horror that is our life. Life is a celebration in many ways, there is so much to be happy and grateful about, but it’s also a cruel, exhausting and poignant endeavour. This duality also exists within each person, each situation and each conscious conviction we hold, and that’s what the essence of the cover is. QUESTION 3- The book is a collection of short stories; is any story based on your personal experience? Alas! I’m not one of those navel-gazing authors with the luxury of embedded research from which they draw their stories. My stories are almost always derived from what I hear, see and feel of this world, some slices of my own experiences but mostly oodles of imagination. QUESTION 4- What do you love writing more, ‘novels’ or ‘short stories’? What comes more easily to you? Short stories to me are like an explosion of truth, snippets that take you into another lifeworld in a brief mad moment of revelation and clarity. Novels are a slow revelation of many truths. I love the short story form more than any other, not just for this experience of it but also its production, as each short story requires an investment of a few months versus a novel that you need to invest a few years of your life into. QUESTION 5- How much do you think living abroad has influenced your writing? I thought it allowed me to view my country, my society and my people more objectively but I’m beginning to realise my leanings are more romantic objectivism. QUESTION 6- How do you manage work and writing? Do you have a plot in mind always, or the story is made up as you begin penning it? As of two weeks ago I’ve become a full-time writer. This is the first time I’ll be devoting all my time to writing so let’s see what that produces. The end of a story typically drives my writing, and I work backwards to see where I can begin it and what I can fill in between. QUESTION 7- ‘Exception and Perfection continues to define you and your books’. What is the secret behind your success? The smell of a new book, my new book, which holds years of my life, my little dreams, and being able to send it off on its own journey, out into the world, which accepts it with a gracious heart and mind, that is success. Nothing, no one, can ever replicate this feeling of joy. QUESTION 8- ‘Meghna as a journalist’ or ‘Meghna as an author’, with whom do you identify more? Being an author seems to be working out much better for me. I guess your true calling is what ultimately defines you. QUESTION 9- Some contemporary authors you love reading? Adiga, Munro, Shamsie, Atwood, Mistry. QUESTION 10- When should we expect your third book? A book takes its own time to become what it’s supposed to be, but I’m aiming for my third book ‘Son of Gods’ to be published by early 2015. QUESTION 11- Quick Fire – Select one between the two! Romance novels or thrillers– I read neither genre, but if I had to chose then thriller. MS word or paper pen– Always the word. QUESTION 12- A message for your readers and budding writers? Write what you’d like to read, fearlessly. And do buy Happy Birthday! for yourself and as a birthday gift for your loved ones. Thank you very much, Ms Meghna Pant for taking time out from your busy schedule for this interview with Indiabookstore. We wish you all the best for your new book and all other future endeavours. Get in touch with the author through her Facebook page or on Twitter. 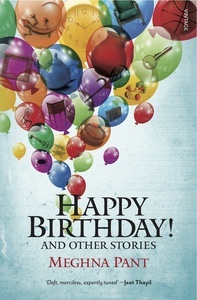 Also read IndiaBookStore's Review of 'Happy Birthday', the latest book by the author!